Here’s our handy guide to Staithes Accommodation. If you are looking for a seaside resort with lots of historical charm, Staithes is the place for you. Once a bustling fishing port with over eighty cobles in its fleet, it is now a quaint tourist destination with plenty to offer. Winding streets and higgledy piggledy houses fill this village with a charm all of its own. Its cliff top walks deliver impressive panoramic views. Rock pools and fossils can be found on its beach and a small collection of cobles viewed in its harbour. Staithes is also home to the Staithes group artists whose work can be seen in the villages gallery. You can also visit the Captain Cook and Staithes Heritage Centre. Captain Cook himself once walked the cobbled streets here when he was a grocer’s apprentice. 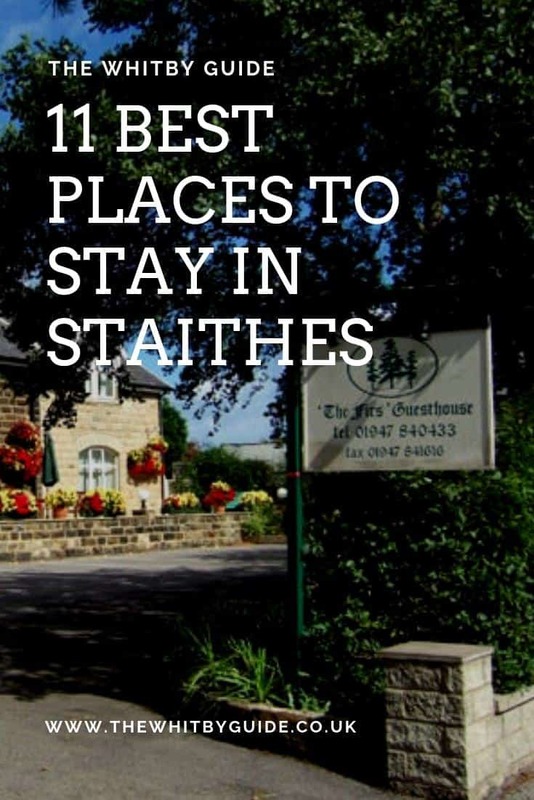 Should you wish to explore other avenues Staithes is on the edge of the North York Moors National Park, home to fabulous scenery, wildlife and walks. Whitby with its impressive Abbey, jet and Dracula connections is only a stone’s throw away. Slightly further away but also worth exploring are Robin Hoods Bay and Scarborough. Staithes is full of holiday accommodation to stay in, most of them being holiday cottages. There are a huge variety of styles for these, from quaint, traditional fishermen’s cottages to modern apartments and flats. Staithes also has a limited number of guest houses, bed and breakfasts and inns to choose from. For other types of Staithes accommodation you have to look further afield but there are plenty with easy access to the village. Guest houses are a very traditional selection when it comes to accommodation for a seaside holiday. There is something very comforting about one that still makes them a popular choice. Of course, nowadays, they are far more modern than they used to be with many being able to rival bigger hotels. This family owned late Victorian accommodation is located in Runswick Bay just two miles from Staithes. It has both twin and double rooms with some flexibility to increase occupancy of a room if requested at the time of booking. Each room is en-suite and has a radio, iPod docking station, and couch. Ground floor rooms are suitable for those with mobility difficulties including having wet rooms. Pets are welcome with doggie towels and showers provided. The Firs can cater to those who are vegetarian or have special dietary needs. The premises are not licensed but you are welcome to bring your own. Moonfleet is a guest house with a twist in Skinningrove, just five miles from Staithes. Not only can you book a room for the duration of your stay but you can book the whole house! Moonfleet is available as a six bed roomed en-suite holiday home. Another grade two listed manor house Moonfleet offers a choice of double, twin and single rooms all with toiletries, wifi, TV, DVD and tea/coffee facilities. There is also an on-site laundry should you need it. Breakfast consists of a buffet style selection of cereals, fruit juices and more followed by a full English, Irish, vegetarian or gluten-free cooked breakfast. Afternoon tea, packed lunches and evening meals are also available. There is also a full bar with darts and pool. Holiday homes have the advantage of being exactly what they say they are; a home away from home! You can cook and eat when you like, come back to your accommodation when you like and without fear of disturbing others. There is also one to suit every size party, from one-bedroom apartments to eight/nine bedroom farmhouses. The following are a couple of Staithes best. The old joiners shop is exactly what it says it is; a converted joiners shop in the heart of Staithes! It sleeps two, has one bedroom, one bathroom and a garden with a patio. Here you have the perfect little romantic getaway for two. Set over just one floor the joiners shop has an open plan living space with French doors leading into the garden space. It is equipped with a modern kitchen, quality furnishings and a bright and cheerful feel. Please be aware there are ten steps up to the property and the front terrace has a large open drop. This makes the property not suitable for children. York house is a grade two listed detached stone property tucked away in the centre of Staithes. It sleeps nine, has five bedrooms, two bathrooms and a garden with a patio. This holiday home is a great choice for groups or those with a larger family. Inside York house you will find a home that is filled with original character. Carved wooden fireplaces, exposed stone walls and age worn timber steps are just some of the features. This holiday home comes with everything you could need including a washing machine, dishwasher, high chair and cot. It also has a games room with a full size pool table, TV, DVD’s, CD’s, books and games. 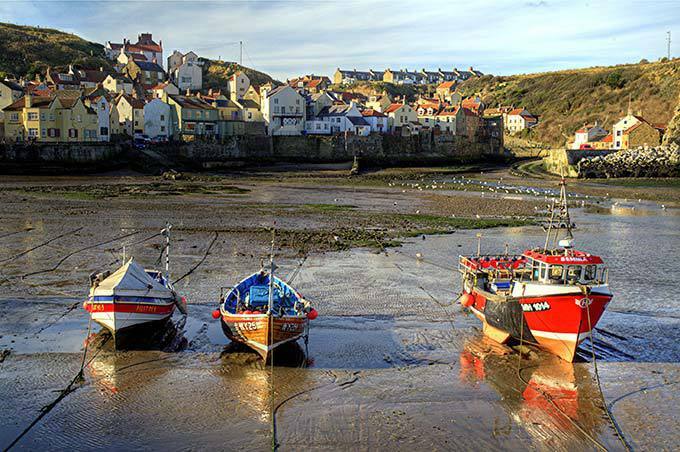 Staithes has a good supply of public houses to choose from, many of which feature in the famous ‘Roxby Run’ pub crawl. Two of these also offer places to stay for those looking for Staithes accommodation! Captain Cook Inn sits on the top of the village of Staithes and is situated on the Cleveland Way. It has nine en-suite rooms all with TV, Freeview, refreshment trays and bathroom goodies. There is also free wifi and parking. In the inn itself you will find a plethora or real cask ales, some local, and a varied food menu with daily specials boards. They also do a full sunday lunch and breakfast for guests staying with them. Please note this inn has six double bedrooms and three family rooms. Family rooms contain a double and single bed. Provisions are possible for an extra child with prior notice. The Royal George is the oldest fisherman’s pub in Staithes and has three rooms all with tea/coffee facilities, TV and wifi. Two of their rooms are king size and en-suite, one is a double with external bathroom. Should you wish to dine and drink at the inn they offer fresh, locally sourced meals and home made meals. Highly recommended are the crab sandwiches and steak pies. You also have the choice of having a full English breakfast here when you stay overnight. The Royal George has a fabulous beer garden for those lazy summer days and also offers a quiz night once a week and Sky sports. If being more active is to your taste the Cleveland Way Walk is situated nearby. Camping and glamping are a fabulous way of getting back to nature and enjoying the great outdoors. This is especially true of such a stunning place as Staithes that is abundant with wonderful views, scenery and places to go walking, cycling and running. Should you wish to camp or glamp near Staithes here are two fantastic sites. Runswick Bay is situated just 2.5 miles from the village of Staithes and close to the Cleveland Way Walk. Tents (up to five metres wide), caravans, motor homes, and camper vans are all welcome here, as are dogs. This site offers the capacity of thirty-two pitches with an electric hook up, mainly grass but a few are hard standing. If you’d prefer to glamp Runswick Bay has several options that all feature oak beds, down bedding and full kitchen set ups. These are available in a shabby chic or nautical option. You will still need to use the campsites shower and toilet block facilities. Situated in Runswick Bay just one mile from Staithes, Serenity camping is a friendly, relaxed and peaceful place to spend your holiday time. It also has the added benefit of being only one mile from Runswick Bay beach and seven miles from Whitby. It is the perfect place to explore from. Both tents and tourers are welcome at Serenity camping with the grounds being mainly grass although they do have four fully serviced hard standing pitches. Dogs are more than welcome here and the facilities are clean and well maintained. The local village is more than equipped to deal with any other needs you may have. It boasts a butcher, two pubs, a fish and chip shop, post office/store, bistro, and coffee shop. If you would prefer to glamp here Serenity have two bell tents, a shepherds hut and a potting shed for you to choose from. Each of these is equipped with a double bed and fairy lights. Some have kitchen facilities, a TV, sofas and a BBQ area. Everyone needs a little bit of luxury in their life now and then and what better time to indulge in it than when you are on holiday? The Grinkle Park Hotel at Easington is an elegant Victorian manor house that still maintains many of its original features. High embossed ceilings, fine wooden panelling and roaring log fires await you in this luxurious twenty bed roomed hotel. Outside you can peruse thirty-five acres of land which include a tranquil lake, secluded woodland and magnificent views over the moors. Croquet, clay pigeon shooting and tennis are available for those who feel a little more energetic. Inside there is a fine restaurant, bar, billiards and a snooker table. Gisborough Hall is a little further afield than any of the other Staithes accommodation recommended but it really has to be stayed at to be believed. This four star Victorian country house is the absolute height of luxury. In total there are seventy one en-suite rooms in this hotel all containing bathrobes/slippers, toiletries, sherry, crystal cut glasses, drinks/snacks, TV with Sky Sports and free wifi. Many rooms have four-poster beds, roll top baths and other quirky features such as porthole windows. For that romantic night away Gisborough Hall also have one room with a super king size luxury bed. Many of the ground-floor rooms come with disabled access having widened doors, grab rails, bath seats and emergency pull chord’s that connect to reception. Dogs are also welcome on the ground floor. Amenities here include a restaurant and bistro with the choice of dining in the drawing room, hall or on the terrace. Afternoon tea is also available. Should you require an extra treat you could always visit the revival zone which offers spa treatments galore. Boutique holiday accommodation has become more and more popular with those looking for something a little bit different. There are lots of different themed ones now where the proprietors have let their imaginations run wild! Dotty’s boutique is located just nine miles from Staithes in Saltburn By The Sea. It is unique in that it only has two en-suite rooms on offer; both of which are vintage heaven! Each of these two rooms has a sumptuous French bed and vintage furnishings and furniture. All things vintage are the proprietors passion! Unsurprisingly there is no smoking in this fabulous rooms. Full English breakfast is provided. St Hilda’s boutique is located just over a mile away from Staithes in Hinderwell. It is a country manor house with an eccentric twist. Every room in this property is inspired by cities of the world! Venice – This en-suite room is full of all things Italian including an Italian sink, bidet and bath. Its crowning glory, however, is its handmade gondola bed. Cairo – If you like things Egyptian, this is the room for you. There are gold cobra handrails, a glamorous four poster bed and sphinx galore. This rooms masterpiece, however, is its jacuzzi bath that has been built to look like a pyramid with mood lighting to fit. There is also a Cape Town room featuring rhino heads and animal print galore and a Los Angeles suite with a ten foot Chevrolet on the wall. If that wasn’t enough, Elvis is inside it waving at you. Finally, and perhaps, more tasteful is the Paris room with its traditional clean blue and white decor. There is, however, a six foot Eiffel tower rising above its jacuzzi bath! Loving these Staithes accommodations? Pin it!